Back cover blurb: The remote Irish village of Duneen has known little drama; and yet its inhabitants are troubled. Sergeant PJ Collins hasn’t always been this overweight; mother-of-two Brid Riordan hasn’t always been an alcoholic; and elegant Evelyn Ross hasn’t always felt that her life was a total waste. So when human remains are discovered on an old farm, suspected to be that of Tommy Burke – a former love of both Brid and Evelyn – the village’s dark past begins to unravel. As the frustrated PJ struggles to solve a genuine case for the first time in his life, he unearths a community’s worth of anger and resentments, secrets and regret. Darkly comic, touching and at times profoundly sad, Holding is a masterful debut. Graham Norton employs his acerbic wit to breathe life into a host of loveable characters, and explore – with searing honesty – the complexities and contradictions that make us human. 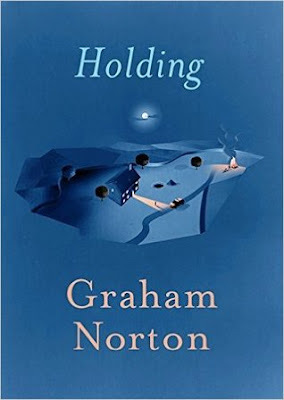 Holding is Graham Norton's debut novel, something that I tried not to let bias my opinion. After reading the first page or so, I was quickly absorbed by his writing and his voice (familiar to many) inside my head disappeared. Holding is a novel with the remote Irish village of Duneen at its heart. Like most remote villages everyone knows everyone in Duneen, and very little happens of any consequence. That is until human remains are discovered on a old farm by building developers. Duneen's Garda (Police) Sergeant PJ Collins has never been called upon to deal with such a serious matter before, and he truthfully has very little idea of what he needs to do. The remains are thought to be those of missing local man Tommy Burke, the former fiancée of Brid O'Riordan and former love interest of Evelyn Ross. Naturally both women are suspected of having an involvement in the disappearance and/or death of Tommy. As PJ struggles to cope with both the investigation and the 'interference' of a Detective from outside of Duneen, the villagers begin to draw their own conclusions about what might have happened upon the farm. Both Brid and Evelyn have reason to suspect and accuse the other, and PJ doesn't know who to trust. And then something happens that throws the investigation completely off course. PJ must start over, forget his ties with the village, and treat everyone with suspicion. it's the only way that he and his colleagues will ever discover the truth. Holding is a solid debut, and I really look forward to reading more from Mr. Norton. Holding is available from 6 October 2016. You can pre-order it now via Amazon online.